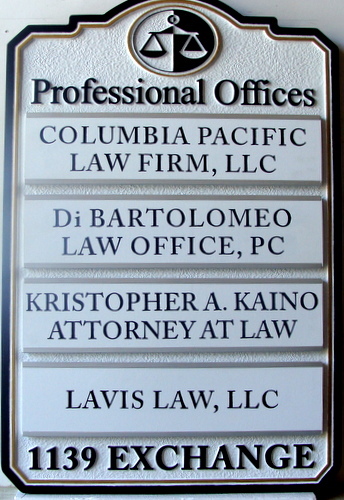 This attractive Professional Offices Directory sign for 4 Law offices is made of HDU, with a sandblasted background (sandstone texture) at the top and raised text and border. The nameplates are engraved smooth-faced HDU., and are readily removable/replaceable through slide-in brackets. This impressive engraved (text carved into HDU) entrance sign has two name signs that can be added to or changed. This is a outdoor sign mounted between two 4x4 wooden posts.Note the bottom signs are not hanging but bolted to the posts, a preferred method.